When Mary R. Haas died in 1996, she left behind several thousand pages of notes and texts in the Creek (Muskogee) language collected in Oklahoma from 1936 to 1940. 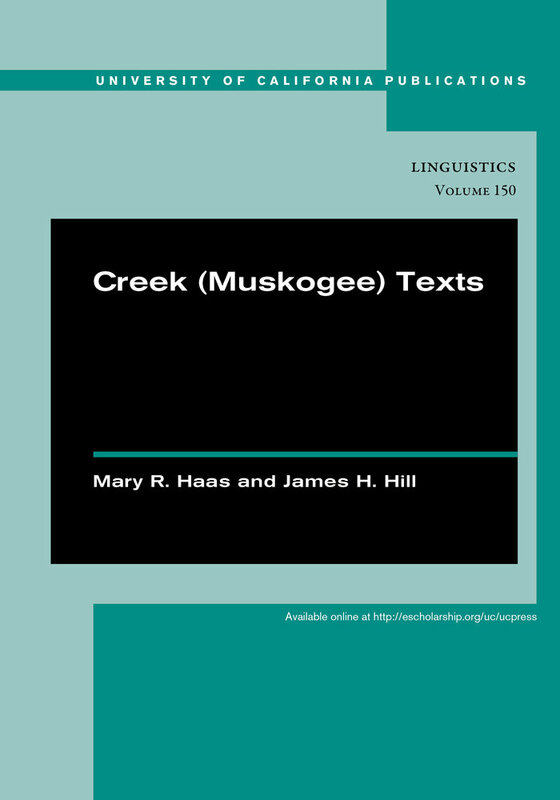 The majority of the texts come from the unpublished writings of James H. Hill of Eufaula, an especially knowledgeable elder who composed texts for Dr. Haas using the standard Creek alphabet. Twelve other speakers served as sources for dictated texts. Mary R. Haas was Professor of Linguistics at UC Berkeley. James H. Hill was a Creek elder who composed texts for Dr. Haas using the standard Creek alphabet. Jack Martin is Professor of English and Linguistics at the College of William And Mary.